The new, Weta 2015 will make its debut at the Auckland On Water Boat Show. 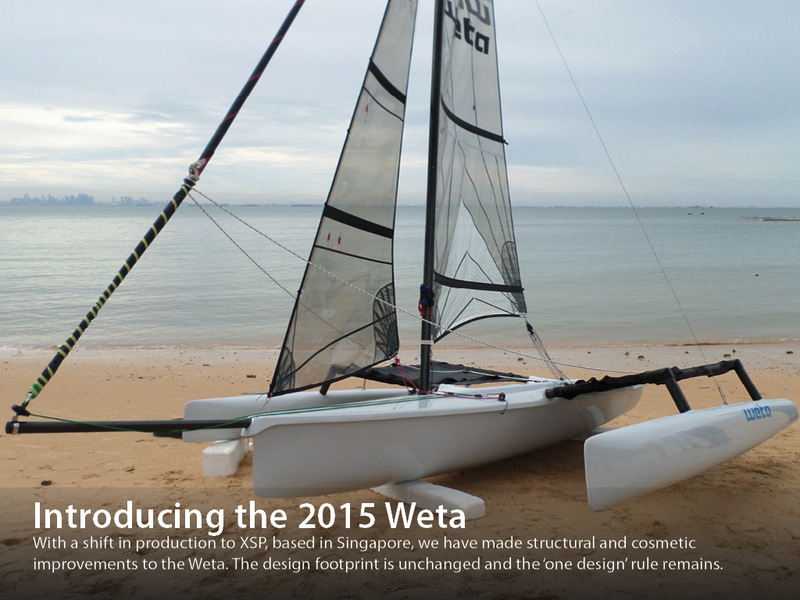 With a shift of manufacture to XSP based in Singapore, Weta Marine has taken the opportunity to improve the Weta Trimaran. The design footprint is unchanged and the ‘one design’ rule will remain in place, but new molds and construction techniques give the 2015 Weta a tighter, better quality build. XSP has been owned and managed by two Australian sailors for 20 years. “When people see this boat they will be blown away by the quality and attention to detail,” says Roger Kitchen, director of Weta Marine. The first container from XSP is landing in Atlanta, Georgia next month, a welcome addition to the growing fleet of over 300 Weta in the US. In New Zealand there are almost 100 Weta sold and the unique ‘WetaFest’ regatta, held in Tauranga in late November attracts beginner to expert sailors with it’s friendly vibe and fun, social atmosphere. Globally the Weta is firmly established, with over 1000 boats sold. The key attribute of the Weta is the versatility; owners enjoy fast one design racing, family cruising and blasting with friends, which is enhanced by the superior quality and attention to detail of the 2015 Weta.